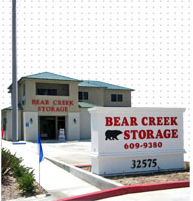 Bear Creek Self Storage, the leader in Murrieta Self Storage & Wildomar Self Storage. Whether Business or personal needs, Bear Creek Self Storage has the perfect storage solution! Our brand new facility utilizes the latest in technology to secure your possessions. Our friendly & professional on-site managers will help you find the perfect size storage unit to meet your specific needs and our competitive pricing makes Bear Creek Self Storage the right choice!